Un paiement immédiat de 42,99 $C est requis. Unit assembled without issue, although instructions were very basic. Installation in vehicle required some finesse but I was able to establish a reasonably effective barrier for my medium-sized dog. Some how-to knowledge is recommended for proper installation. Adjustibility seems to be good for most vehicle types, although those with larger vans or SUV type vehicles might experience strength issues because the unit is weaker at full horizontal and vertical extension. As for me, I am satisfied with my purchase. 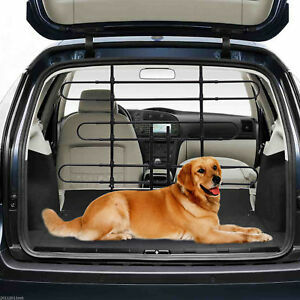 This pet barrier lasted one car trip. Stays up with pressure, but becomes unscrewed by itself and will fall over when the pressure is gone. Lightweight enough that a small dog could easily knock it over. Extremely disappointed in this product. Although photo looks like the barrier can be used between front seat and back, it is not designed for that. It's to separate cargo area from back seats. It is ridiculously difficult to fit together. Some parts do not fit even when “warmed up in water” as per instructions. The metal is thin and bends easily. It would not hold up to my 80 pound dog pushing on it.